Thousand Oaks boasts also gorgeous homes with incredible views, many of which are lucky enough to have a pool. However, as you likely know, having a swimming pool requires upkeep. Beyond regular cleaning, you may find yourself in need of a pool remodel. Whether you feel that your pool is out of date and in need of a refresh, or whether there is a functional issue with your pool that is not a quick fix, Valley Pool Plaster is here to help you get your pool looking and working just like you want. Let’s take a look into how Valley Pool Plaster can work with you to turn your Thousand Oaks pool into your perfectly peaceful California oasis. Sometimes, replastering your pool just isn’t enough to fix what you need. There are times when you are going to need a complete remodel, and that is where Valley Pool Plaster comes in. Pool technology has made great advances in the past few years, and so have the styles and tastes when it comes to plaster, pebble, and lighting. If you are looking to remodel your Thousand Oaks pool, you are likely looking to bring new life and functionality to your pool, and Valley Pool Plaster has the skills to bring you that fresh and modern pool you are looking for. Infinity Pool. This is the perfect pool if you have a yard with a view. Just imagine sitting in your pool, staring out the beautiful area around you, feeling just on top of the world. Sounds pretty incredible, right? Waterfall Addition. Many people are looking to add a waterfall feature to their pool to really take it to the next level. You can choose how big or small, how thin or thick you want your waterfall to be. Sitting in your pool near the waterfall can be incredibly relaxing and make you feel like you have transported to the wilderness. Unusual Shape. You are no longer stuck with the standard square, rectangle, or oval shape options for your pool. With advanced technology and advanced skill comes advanced shapes. 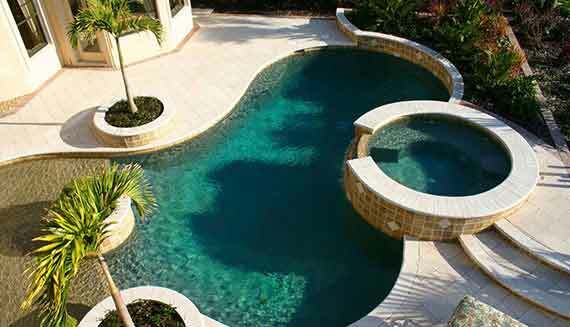 You can opt to have your pool made in a variety of shapes to truly make it feel like your own oasis. The process of remodeling your pool can be quite a process, but Valley Pool Plaster is here to see you through the process worry-free from start to finish. 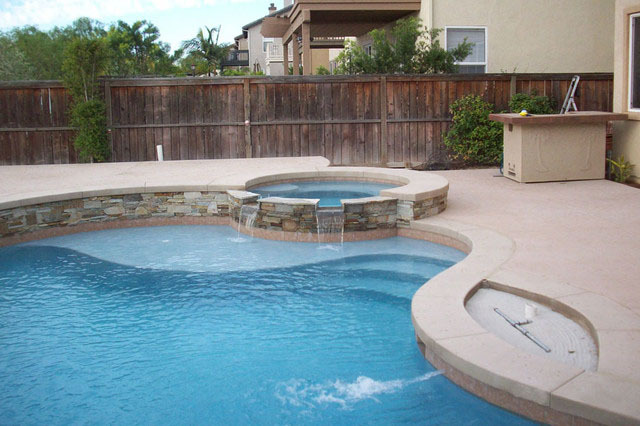 Here are the general steps we follow during your pool remodeling in Thousand Oaks. Design. The first part is designing your dream pool. Once we have an idea of what you are looking for, we will draft up renderings of your design for your approval. Permits. Once you have approved the design, we will apply for the necessary permits to make the changes to your pool. Layout the New Pool. 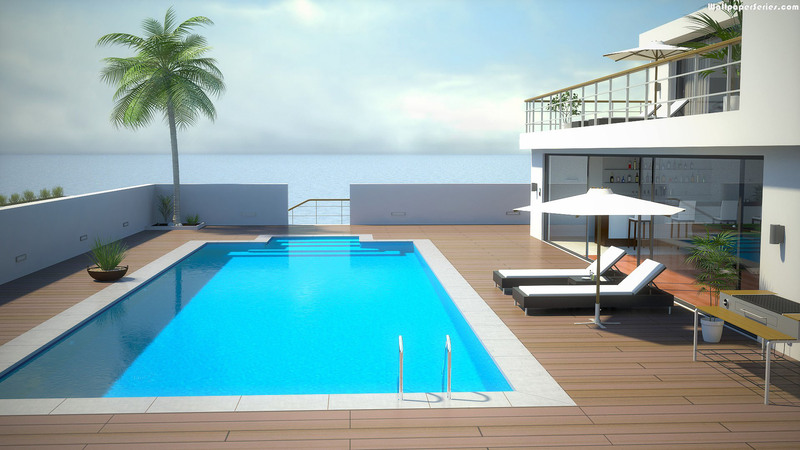 The next step is laying out your new pool, which will allow you to get a better feel of what the pool will look like in real life. Excavation. Then the excavation begins. Laying the Groundwork. Next we will lay the groundwork for your new pool, including the steel framework, the plumbing, the electrical, and all necessary equipment. Laying the Cement and Tile. After getting those things down, we will lay the cement and tile for your pool, completing the structural work. Designing Begins! Now we begin on the design of your pool with things such as decking and plastering. Finished Product. 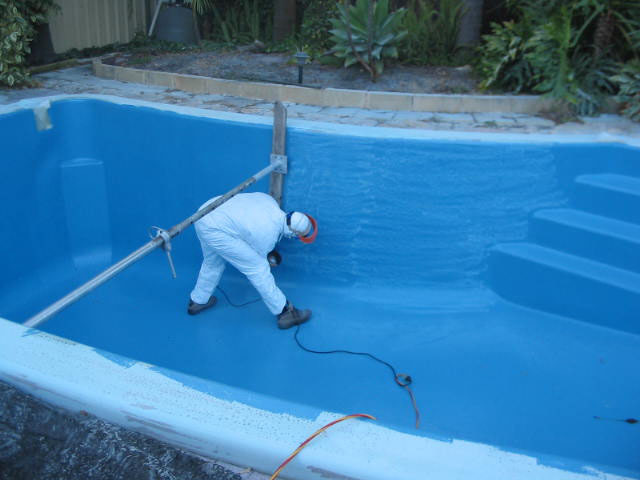 Once the plaster has been laid, the chemicals are put into your pool and it is ready for you to enjoy. It is possible that you may not need an entire remodel of your Thousand Oaks swimming pool; you may just need a replaster. The change in seasons can be quite harsh on your home’s swimming pool. From cracks to stains and more, the appearance of your pool definitely deteriorates over time. The best way to fix the toll the time is taking on your pool is to replaster it. When your plaster is properly mixed, treated, and applied, it can last you 10-15 years! By merely painting your pool, you are buying yourself just a couple of years before you will have to do it again. Our pool plaster is incredibly durable and can withstand a great deal. 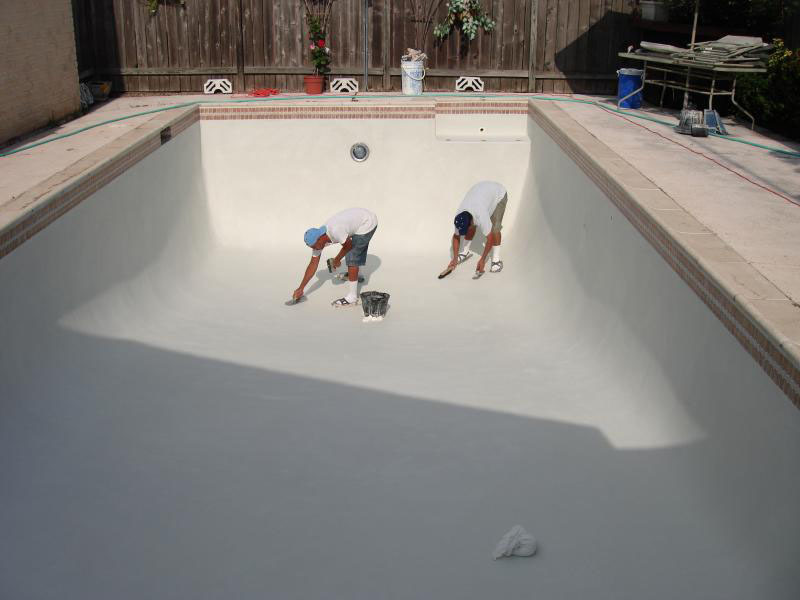 With painting your pool, you are unable to use your pool for at least two days while the paint dries. When you replaster your pool, however, you can use it within hours of completing the plastering. The plaster is simply mixed, placed, and smoothed, and ready to use in five hours. Drain the Pool. First you must drain the pool, or we can do it for you. Typically it is drained to the street, unless you specify somewhere you would rather have it go. Out With the Old. The next step is for our team to chip off the old plaster and remove the tile in your pool. We do this using jackhammers and other tools, and we do it carefully so as to protect your pool and the rest of your property. We clean up afterwards and haul away all old plaster. Tiling. Once the old plaster is out, our team of tile and masonry experts comes in and installs tile or other decorate features that you had requested. Final Pre-Plaster Inspection. Once the tiling and other features are set, we will do a final pre-plaster inspection to ensure your pool is set for replastering. Lay New Plaster. 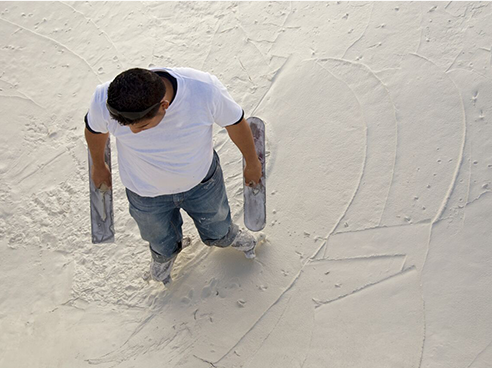 Following the final inspection, our team will replaster your pool with the material that you have chosen. Once the new plaster has been laid, you are ready to refill your pool and rebalance the chemicals that will help the new surface properly cure and last you many years. Then, you are all set to go swimming in your freshly plastered and completely new-looking Thousand Oaks pool! 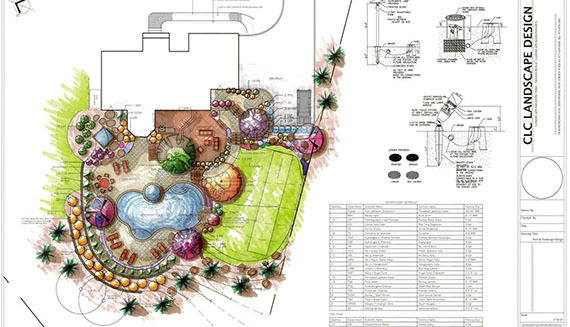 We will provide you with detailed renderings of your pool layout, to make sure that your expectations are fulfilled. This also enables you to make revisions and improvements as required before building begins. We apply for the required licenses for the swimming pool replastering and create detailed engineering drawings once you’ve approved your layout. This is actually the first-step within your pool’s development. We lay out it in your yard and will take the dimensions of the pool. This is an opportunity for you to see the design of the shape and size any last minute modifications must be created. After the format, the true work begins. 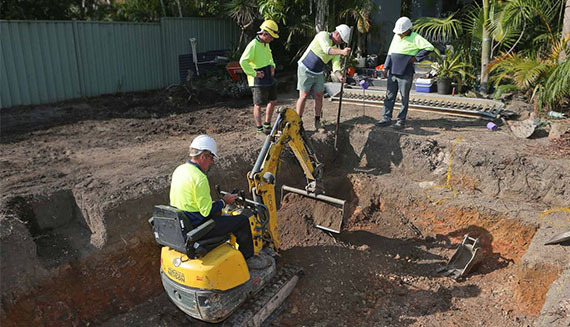 Particular equipment will undoubtedly be used to excavate earth and the lawn from your lawn to make space for the new share. This task typically takes the dirt that’s removed and just two or one times can often be removed or simply just used in another area of the yard, in accordance with your choice. After the excavation phase, a steel team will start building the skeleton for the swimming. This forms design and the design. The metal supports are placed all-along the facets and bottom of the swimming pool to supply architectural integrity, making your pool tough and long lasting. We have to deploy all of the plumbing and electric before introducing concrete. We make sure that the plumbing is pressure tested and the electric meets the required location and state codes. 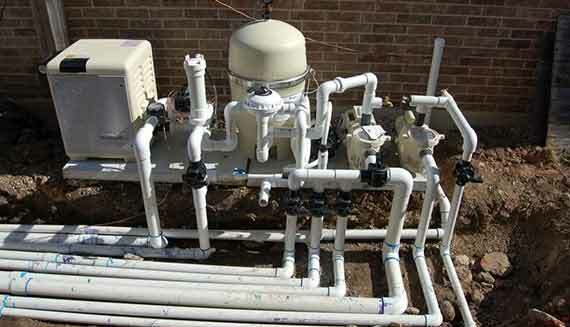 Correctly sized plumbing is essential to proper circulation and pump efficiency. While plumbing work is occurring, you will see the installation of utilities and the installation/ setting up of the equipment. Including pumps, heaters, filters, and (optional) salt cells. The pool remodeling contractor to make sure the job is certainly going smoothly and also everything has been finished correctly will also makes assessments. 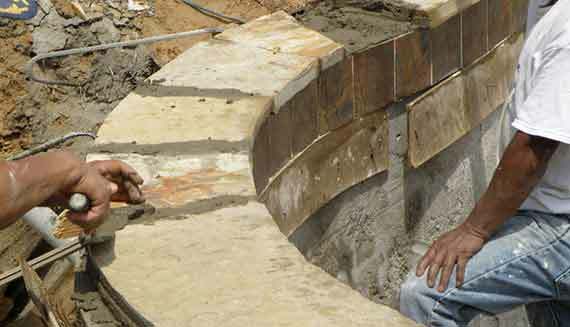 A skilled group may utilize the gunite (cement) to produce the difficult inner layer of the new share. 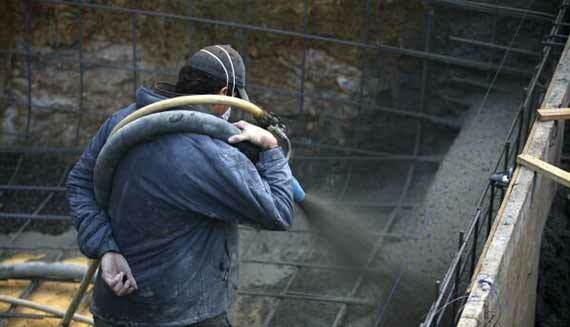 This cement is really a dry mix to which water is added onsite from a hose. The quantity of water will be correctly controlled in order to ensure the proper consistency. After this move, your swimming pool will require around a week to dry. Through that time, so that you can avoid cracking while it dries, it’ll have to be watered repeatedly a day. Now that every one of the structures for that swimming pool has been produced, the decorative process can start! Centered on your style and design, an excellent selection is available, including natural stone tiles, slates, ceramics, and mosaics. 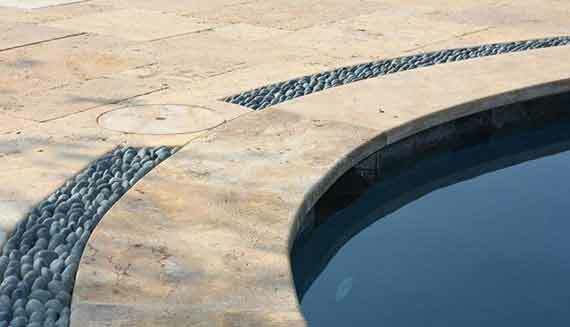 Pool coping can be crafted from a variety of materials, such as natural stone, brick, or cement. After this step, your pool will be fairly close to completion! Decking is the surface that surrounds your pool’s border. Various surfaces may be used here, like stamped concrete or custom stone. During this step, any features as part of your layout, for example outside fireplaces, firepits and kitchens will be installed. 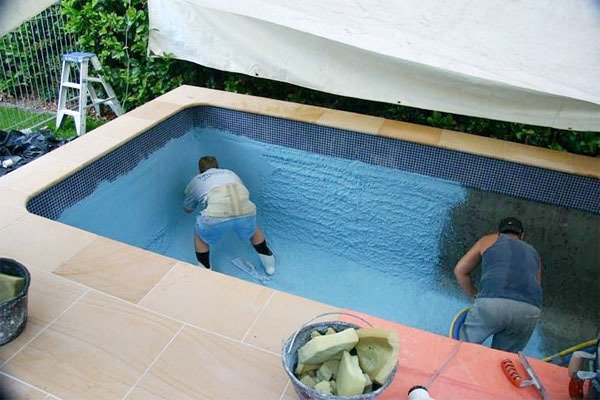 Utilizing the plaster is actually a complex approach that must be performed thoroughly to ensure that your pool features a gorgeous, long lasting finish. The pool is filled with water after plaster is totally used. According to how big your pool is, filling with water typically takes two or a day. To be able to remove plaster dust, one or more times per day it’ll need to be brushed. After the substance has treated, a specialist is able to do a “start-up,” that involves adjusting the chemicals inside your new pool. Your swimmingpool redesign is complete! Please let’s know if there’s anything we’ve missed you still need. Great communication is our best concern, so you feel excited and satisfied about your new pool.